Soft “took.” Song is a slow series of variously pitched notes, all rapidly trilled. Description: Male is slate-gray above; rusty-orange below, with a broad black breast band; orange eyebrows and wingbars. 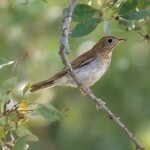 Female is brown above and paler overall. Juveniles similar to females but with white belly, and a scalier looking breast and throat. Habitat: Usually found in coniferous montane forests. 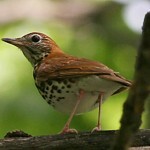 Migrants will move into more open woodlands. Sometimes wanders widely during winter. Where in Nebraska: Rare vagrant. 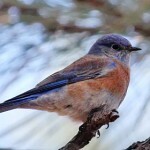 Observed in at least five counties, mostly during the spring and fall months. No obvious geographical pattern to occurences. 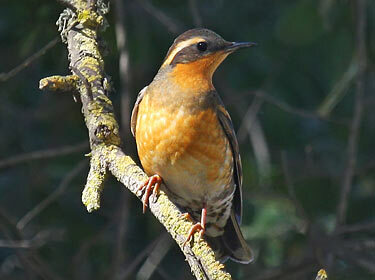 Fun Facts: To defend a territory a male Varied Thrush may first give a Tail-Up display where the bird faces away from the intruder and holds its tail up to show off.